Does Privatizing Medicaid Save Money? The Jury's Out In Iowa : Shots - Health News To save money, Iowa recently turned over its Medicaid recipients to private managed care companies. Now, some companies are losing money and some people say they're not getting necessary care. Neal Siegel, who lives with his girlfriend, Beth Wargo, is one of six disabled Iowans suing the state over its privatized Medicaid program. Medicaid serves people with disabilities, low-income people and people in nursing homes. A combination of federal and state funds pays for the program. It covers 74 million people across the country these days, about half of whom are in Medicaid managed care. "I would probably put Neal at about 98 percent cognitive of what's going on around him, but unfortunately not able to articulate it," says Siegel's girlfriend, Beth Wargo. "So it's being trapped inside your own body." 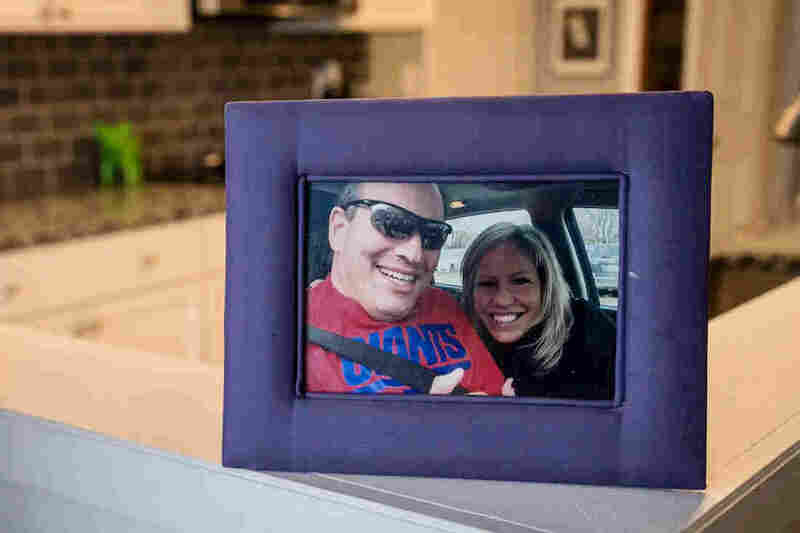 Neal Siegel and Beth Wargo, in a photo taken after Siegel's accident in a hit-and-run bicycle crash left him with a severe brain injury. Eventually, he moved home with Wargo, where he is reliant on caregivers to assist him with all activities of daily life. Then last year, Wargo says, they got a letter in the mail from AmeriHealth Caritas, the company that manages his care. Siegel's budget for home help had been slashed by 50 percent, Wargo says. Siegel's face lights up as Wargo talks about the lawsuit, and he manages to say, "Oh yeah," when she mentions how happy they were that they could be part of it. "The system is too stressed right now with the way it's being managed, and it's not healthy for individuals with chronic or serious disabilities," says Miller. According to the lawsuit, the company claimed that spending on Siegel's case was cut because it had exceeded a limit set in state policy. A spokesman for AmeriHealth Caritas said the company could not comment on ongoing litigation. The state has asked for the lawsuit to be dropped. Iowa Department of Human Services Director Jerry Foxhoven defends moving the entire Medicaid population to managed care. He says more taxpayer dollars will be saved under private management. But he says his agency is willing to make changes, especially for people like Neal, who have serious disabilities. "Everything's always on the table. We're always looking at everything to say how do we best serve the people we're trying to serve and be the best stewards of taxpayer dollars," Foxhoven says. For their part, the three companies with contracts in Iowa say in statements that the first 18 months have been successful. But they also have said to state officials that reimbursement rates were based on deeply flawed cost estimates provided to them before the project began. So where is the savings? So far, no state has actually done a comprehensive review of whether private companies actually save Medicaid dollars, says Kelly Whitener, an associate professor with Georgetown University who studies managed care. "You'd really need to be able to see are you saving money overall or not, and if you are spending less money, are you suppressing services that are needed? Or are you really finding efficiencies and only delivering care that families really need?" says Whitener. For the moment, those questions don't have definitive answers. Meanwhile, Iowa has to balance its books. Republican Gov. Kim Reynolds had to tap more than $260 million of the state's reserve fund this year, and officials expect next year's budget will be even tougher to negotiate. Medicaid funding will likely be a large part of the discussion.